As I share in my book, the best way to figure out your path in life is to learn from those who have done what you want to do. 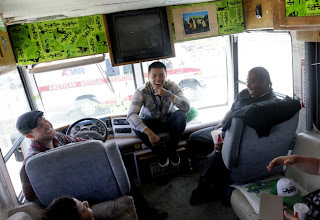 Roadtrip Nation has taken that concept to another level by taking college students on a green RV across the country each summer to interview people who have found their own path in life, documenting the entire experience like a reality show. Ray (middle) having a great time on the roadtrip. I recently met the Roadtrip Director (who is always looking for college students to be on the show) and found out he is a proud community college graduate. What led you to community college? In high school I had a lot of passions and interests, like music and writing – but people were telling me I shouldn’t study those things. I didn’t feel empowered or feel a lot of support. I went to San Jose University just because it seemed like what I was ‘supposed’ to do. After one semester I realized I didn’t know why I was going to school. I wasn’t feeling connected and I didn’t have a purpose. So I decided to reboot and go to community college where I could take some time to figure out what I wanted to do without feeling the pressure of high tuition. How did your community college experience change you? The first two classes I took in community college were comedy improvisation and speech class. I got two A’s and was blown away - I had never been a straight A student and now I had a 4.0! I realized when you like what you are learning it changes everything. I also started getting involved and saw the power of getting engaged with things that you cared about. I became a part of the student senate and saw the power of being able to have a say on your campus. At a bigger campus I felt really disconnected, but in community college I felt like I had a say. I found a lot of motivation that I didn’t have in high school, and a lot of empowerment. I realized when I show initiative, and speak my mind, and push for what I believe, change can happen, I can invoke change on my campus. That was a really big turning point for me. I also met a lot of ambitious people who really wanted to go places and that influenced me. From there I transferred to UC Irvine and got my Bachelors in 2007. What led you to working for Roadtrip Nation? After I graduated college I was convinced that I was going to change the world (typical millennial fire). But around the time economy was struggling; I sent out over 80 resumes and got only three emails back. I didn’t get a single interview. I was feeling really bummed. I was a college grad, wasn’t making any money, and wondered how am I supposed to make ends meet? I was living in friend’s garage, and one day he told me “The time you’re most idealistic is when you’re in college, until the real world hits.” So I had to ask myself, do I really believe this, do I just have to buckle down, or am I going to grind and really do what I believe in and do the jobs I need to do to get by until I get into what I really want to do? I worked a variety of part time jobs for months, always on the lookout for something where I could really make a difference. And then one day looking for a job on craigslist I saw a posting to be a student on this documentary series to do a summer trip traveling on an RV and interviewing people. Angels sung and sun came through the clouds and I thought YES this is exactly what I want and need. I was lucky enough to be a part of the documentary. The road trip confirmed everything I believed in; it was eye-opening talking to people who had made it in the fields I was passionate about. They were telling me there’s a place in the world for you and what you care about. After the trip I had to go home as my dad got terminal cancer - that was a very tough time. A couple days after my dad passed away Roadtrip reached out to me and asked if I’d be interested in being a roadie for them as they traveled to different college campuses. I said yes! I was an intern and worked really hard. I eventually got a job in outreach and then became the roadtrip director where I get to help pick students for the documentary. 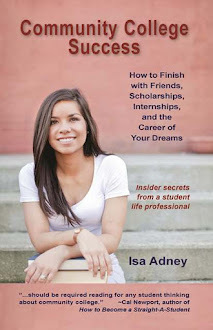 What advice do you have for current community college students to help them succeed? From my own experience, the most formative thing in community college was finding your own power and strength in the community itself. Heck, “community” is in the name! You can see the change in a smaller community, and you can make that change. There are so many things you can get involved with. Start with those little seeds, and surround yourself with likeminded people who want to succeed. And embrace the potential of community college. Out of HS I wouldn’t have been able to get into UC Irvine. But after community college a whole new world opened up to me. The things I learned in community college empowered me to do the work I do today.